One of the young victims being prepared to dive out of the submerged Tham Luang Caves on Monday. Thai authorities say four more boys were rescued Monday after having been trapped in a flooded cave for more than two weeks. The four boys will join four others rescued Sunday out of a group of 12 and their soccer coach. Rescue operations have halted Monday and will resume rescuing the remaining four boys and their coach from the Tham Luang caves on Tuesday. Many of the boys have been airlifted to a hospital in Chiang Rai after initial treatment at a field hospital near the caves, and the four boys rescued Sunday were said to be “in good condition”. The children’s families have not been told which boys have been rescued. 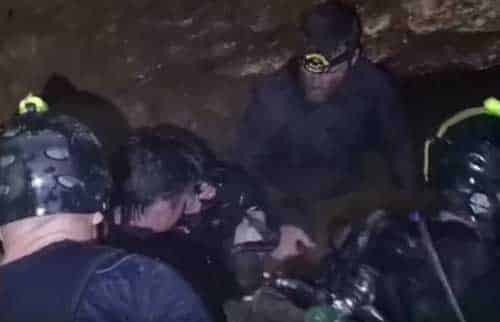 Interior Minister Anupong Paojina said the same divers who participated in Sunday’s rescue are conducting the operation Monday because they are familiar with the cave conditions. The group is stranded about four kilometers inside the cave. Loud cheers broke out when the acting governor of Thailand’s Chiang Rai state, Narongsak Osatanakorn, announced Sunday that the first boys had been brought out of the cave. Following the initial rescues, the operation was paused for about 10 hours while divers replenished air tanks along the exit tunnel. Thirteen international divers and five Thai Navy SEALs are involved in the rescue operation. None of the trapped boys have ever been diving before and some do not even know how to swim. Two divers are helping each one make his way through very narrow tunnels that twist and turn, and filled with dark muddy water. It takes the divers about eight hours to get into the cave, reach the boys, and bring them back out. Monsoon rains have started falling again, causing water levels inside the cave to rise, squeezing the boys in an ever-shrinking space inside the cave, and causing oxygen levels to drop.